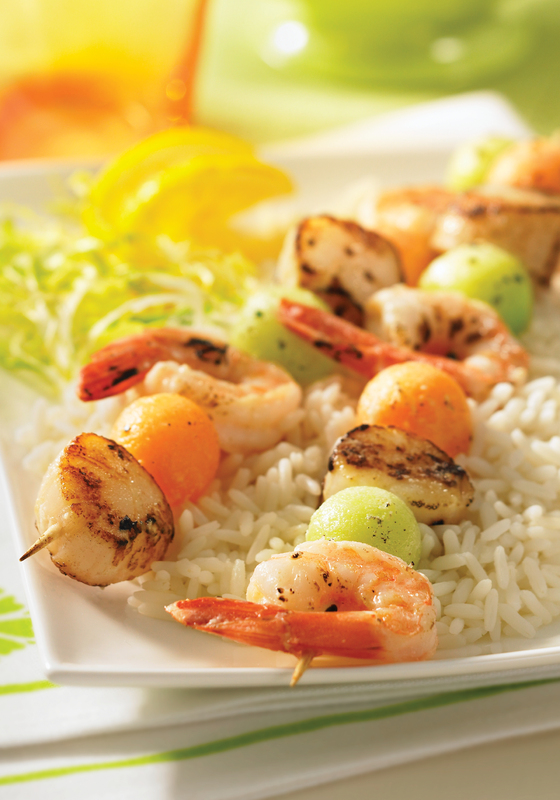 On six 8-inch (20 cm) skewers, alternate seafood and melon balls. Mix lemon juice and butter. Broil kabobs 10 minutes, turning and brushing occasionally with lemon juice mixture. (Seafood should be opaque.) In a small saucepan, melt cheese and gradually whisk in cream. Drizzle the cheese mixture over kabobs. Broil until golden brown. Serve over rice. Serves 6. Note: 2 lbs (1 kg) of firm fish such as monkfish, shark or swordfish is a tasty alternative to the scallops and shrimp. What you seize is what you get! Prepare chicken and asparagus. Combine butter, mustard, garlic and wine. Dip chicken breasts in this mixture to coat. Place 3 asparagus spears on each breast and roll securing with a toothpick. Mix bread crumbs, Parmesan and parsley together and roll breasts in this mixture. Bake 30 minutes at 350 F. Serves 4 – 6. Pass the blender hollandaise sauce and hear the raves. Serves 4 – 6. Pass the blender hollandaise sauce and hear the raves. In a small saucepan bring water and sugar to a boil. Simmer until sugar has dissolved. Yields 2 1/2 cups. Cut pineapple into chunks and puree in food processor. Mix 2 1/2 cups pureed pulp with simple syrup and lemon juice. Strain through sieve. Freeze in a 9″x13″ glass baking dish or an ice cream maker. When solid, break into pieces and pulse in chilled food processor until smooth. Store in plastic container in freezer for up to 2 weeks. Puree rhubarb in food processor. Strain through sieve or cheesecloth, pressing to extract all of the juice. Discard pulp. Mix juice together with simple syrup and lemon juice and freeze in a 9″x13″ glass baking dish or an ice cream maker. Process as for Pineapple Sorbet. Cut watermelon in pieces and puree in food processor. Mix 3 cups of puree with simple syrup and lemon juice. Freeze in a 9″x13″ glass baking dish or an ice cream maker. Process as for Pineapple Sorbet. If Superman is so clever, why is his underwear on the outside? Last year was certainly an exciting one with the release of our new book, Best of Bridge Sunday Suppers, and a cross-country tour in which we were able to connect with so many of you. We enjoyed a much-needed break to spend time with friends and family over the holiday season and we spent the first few weeks of January reflecting on resolutions for the new year ahead. If we had to prioritize one resolution for 2018, it would be what we’re calling the “Sunday Suppers Resolution.” In 2018, we resolve to reserve a few Sundays each month to reconnect with those that mean the most to us over – you guessed it! – a truly fantastic meal. We’re hoping that you will join us in making this one of your goals for the new year, and we have just the perfect cookbook to help you accomplish this! Wishing you all a happy and healthy 2018! THIS COMFORT-FOOD FAVORITE TASTES EVEN BETTER TOPPED WITH GARLIC MASHED POTATOES. USING A LARGE NONSTICK FRYING PAN, COOK GROUND BEEF OVER MEDIUM HEAT UNTIL NO LONGER PINK. BREAK MEAT UP AS IT COOKS. ADD ONIONS AND GARLIC; COOK UNTIL SOFTENED. STIR IN FLOUR, SALT, PEPPER, THYME AND SAVORY. ADD BROTH, WATER, WORCESTERSHIRE,BAY LEAF AND CARROTS. SIMMER, STIRRING OCCASIONALLY, FOR ABOUT 20 MINUTES, OR UNTIL QUITE THICK AND CARROTS ARE TENDER. STIR IN CORN. REMOVE BAY LEAF. SPREAD MIXTURE IN A DEEP CASSEROLE. LET COOL SLIGHTLY. TO MAKE GARLIC MASHED POTATOES: PLACE POTATOES IN A SAUCEPAN WITH GARLIC AND COVER WITH WATER. ADD SALT, BRING TO BOIL AND SIMMER GENTLY UNTIL TENDER. DRAIN WELL AND MASH. BEAT IN BUTTERMILK, SALT AND PEPPER. RESERVE 1 TBSP. (15 mL) OF BEATEN EGG AND ADD REMAINDER TO MIXTURE. SPREAD POTATO MIXTURE OVER MEAT AND BRUSH WITH RESERVED EGG. BAKE AT 350°F (180°C) FOR 40–45 MINUTES. A WOMAN’S WORK THAT IS NEVER DONE IS THE STUFF SHE ASKED HER HUSBAND TO DO. The superb flavor of jerk pork – the perfect dinner for a summer’s day. This recipe looks involved but it’s not. To prepare pork: preheat oven to 350°F (180°C). Combine salt, pepper, cumin, chili powder and cinnamon. coat pork with spices. Heat oil in ovenproof frying pan over moderately high heat; brown pork, turning often. Leave in pan. To make glaze: Combine ingredients and pat onto tops of tenderloins. Roast in middle of oven for about 20 minutes. Let stand at room temperature for 10 minutes. To make vinaigrette: whisk together juices,mustard, curry powder and pepper. Add oil in a stream, whisking thoroughly. For the salad: cut oranges crosswise into thin slices. Toss spinach, cabbage, peppers and raisins in a large bowl with 1⁄2 cup (125 mL) vinaigrette. in rows on top. Drizzle some vinaigrette over avocado and oranges. Pour juices from frying pan over pork.